3. They’re high levels of easily-digestible protein helps stabilize blood sugar when eaten as a snack throughout the day. Stable blood sugar means weight loss if you’re trying to lose. 4. High in Omega 3s, pumpkin seed oil has been shown in studies to reduce the incidence of benign prostatic hypertrophy (BPH)—a condition in which the prostate gland becomes enlarged. 5. Pumpkin seeds are also high in the prostate-protecting mineral zinc, making these seeds the ultimate snack for men’s health. 6. They’re a good source of blood-building and energy-boosting iron. 7. In animal studies, when pumpkin seeds were added to the diet, the anti-inflammatory results were comparable to the effectiveness of the drug indomethacin—without the side-effects. 8. Their phytosterol compounds are believed to lower cholesterol levels. Of nuts and seeds, pumpkin seeds have the second highest amount of sterols (next to sunflower seeds and pistachios which tied for first). 9. Pumpkin seeds are an excellent source of fiber which helps keep you regular. 10. They are alkalizing to the body’s pH. Many snack foods are acid-forming in the body. Acidity has been linked to pain, illness, and even cancer. To preserve the health benefits of the oils found in pumpkin seeds, eat them raw or roast them on a baking sheet on low heat in the oven (about 170 degrees F or 75 degrees Celsius) for 15-20 minutes. Toss with a sprinkling of sea salt and enjoy. If you haven’t tried them warm, you’re in for a real treat! Add raw pumpkin seeds to salads, dips, or ground in pesto. Pumpkin seeds are high in calories, about 559 calories per 100 g.
Are filled with lots of minerals including phosphorus, magnesium, manganese, iron and copper. Are a good source of vitamin K.
Contain phytosterols, compounds that that have been shown to reduce levels of LDL cholesterol. Contain L-tryptophan, which helps with good sleep and lowering depression. Tryptophan is converted into serotonin and niacin. Serotonin is also very helpful in helping us to have a good night’s sleep. Are high in zinc, making them a natural protector against osteoporosis. Low intake of zinc is linked to higher rates of osteoporosis. In a study of almost 400 men (age from 45-92) published in the American Journal of Clinical Nutrition they found a correlation between low dietary intake of zinc, low blood levels of the trace mineral and osteoporosis at the hip and spine. Are a good source vitamin E; they contain about 35.10 mg of tocopherol per 100 g.
Are the most alkaline-forming seed. Are an excellent source of vitamin B group (thiamin, riboflavin, niacin, pantothenic acid, vitamin B-6 (pyridoxine) and folates). Contain good quality protein. 100 g seeds provide 30 g.
Reduce inflammation for arthritis without the side effects of anti-inflammatory drugs. Are used in many cultures as a natural treatment for tapeworms and other parasites. Are good for prostate health! The oil in pumpkin seeds alleviates difficult urination that happens with an enlarged prostate. Pumpkin seeds have long been valued as a source of the mineral zinc, and the World Health Organization recommends their consumption as a good way of obtaining this nutrient. 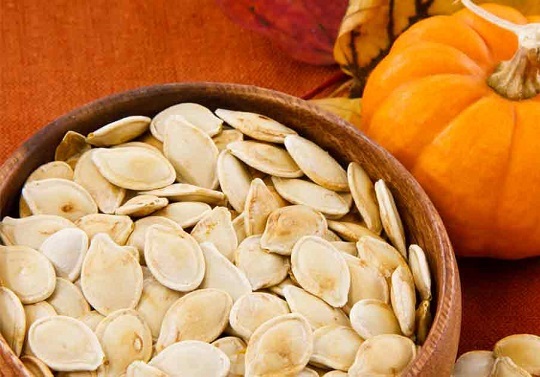 If you want to maximize the amount of zinc that you will be getting from your pumpkin seeds, we recommend that you consider purchasing them in unshelled form. Although recent studies have shown there to be little zinc in the shell itself (the shell is also called the seed coat or husk), there is a very thin layer directly beneath the shell called the endosperm envelope, and it is often pressed up very tightly against the shell. Zinc is especially concentrated in this endosperm envelope. Because it can be tricky to separate the endosperm envelope from the shell, eating the entire pumpkin seed—shell and all—will ensure that all of the zinc-containing portions of the seed will be consumed. Whole roasted, unshelled pumpkin seeds contain about 10 milligrams of zinc per 3.5 ounces, and shelled roasted pumpkin seeds (which are often referred to pumpkin seed kernels) contain about 7-8 milligrams. So even though the difference is not huge, and even though the seed kernels remain a good source of zinc, you’ll be able to increase your zinc intake if you consume the unshelled version. While pumpkin seeds are not a highly rich source of vitamin E in the form of alpha-tocopherol (they come in 31st among our WHFoods in terms of their vitamin E richness), recent studies have shown that pumpkin seeds provide us with vitamin E in a wide diversity of forms. From any fixed amount of a vitamin, we are likely to get more health benefits when we are provided with that vitamin in all of its different forms. In the case of pumpkin seeds, vitamin E is found in all of the following forms: alpha-tocopherol, gamma-tocopherol, delta-tocopherol, alpha-tocomonoenol, and gamma-tocomonoenol. These last two forms have only recently been discovered in pumpkin seeds, and their health benefits—including antioxidant benefits—are a topic of current interest in vitamin E research, since their bioavailability might be greater than some of the other vitamin E forms. The bottom line: pumpkin seeds’ vitamin E content may bring us more health benefits that we would ordinarily expect due to the diverse forms of vitamin E found in this food. Roasting time for pumpkin seeds better be no more than 15-20 minutes when roasting at home. This recommendation supported by a new study that pinpointed 20 minutes as a threshold time for changes in pumpkin seed fats. In this recent study, pumpkin seeds were roasted in a microwave oven for varying lengths of time, and limited changes in the pumpkin seeds fat were determined to occur under 20 minutes. However, when the seeds were roasted for longer than 20 minutes, a number of unwanted changes in fat structure were determined to occur more frequently.